Lexus has made public price details about the new 2010 Lexus IS 250 models, and now includes versions of F-Sport and 220D. 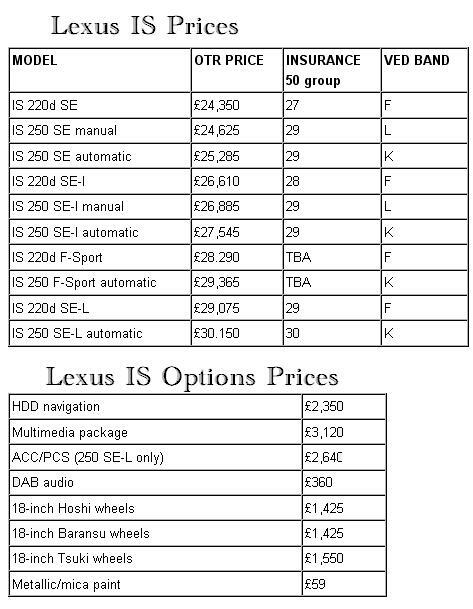 As you can see, we have full price list for Lexus IS model and for all its options. If we speak about the options we refer to: lower suspension, 18-inch alloy wheels, rear lip on the bonnet and the interior sports seats, aluminum pedals, new navigation system HDD and also new Audi DAB-ready. More pictures of 2010 Lexus IS model.